We all love traveling, whether it's just going out of city or travelling abroad. After working 6 days a week, giving ourselves some private time and mind rest is a healthy thing to do. The smart way of travelling is by packing light as we all tend to carry back more stuffs than what we first brought. However, it's nuisance to carry all the essential beauty and makeup kit in full size. Here is the all-in-one Skin Shield Travelling Set (worth RM500) exclusively by SkinSoul. This set comes with 5 deluxe size of all the essential beauty care products we needed. The organic Ashitaba also has amazing healing and regenerative abilities to reverse signs of ageing. It is proven to smooths wrinkles, fade age spots, regenerate skin elasticity and suppleness, heal skin irritation and improves skin radiance! As for Skin Shield skincare range,it is made of pure organic Ashitaba and a fusion of other precious botanical extracts that work in synergy for the ultimate skin renewal. The 4 Powerful active ingredients in Skin Shield. Unique red micro algae that protects our skin from oxidative damage, pollutants and radiation. Extract from a rare type of apple that only grows in the Swiss Alps, it prevents aging and trigger the skin;s stem cell-driven potential for skin rejuvenation. Skin lightening by influencing melanin formation. Only pure Swiss Glacier Water from the Valais Alps is used as water base and encapsulated into liposomal forms to reduce toxicity and increase efficiency via nanotechnology. I love how this cleanser removes impurities from my face in the gentlest manner. You will be surprised that only 3-5 drops is needed to cleanse the entire face. The smell is mild. It does not strip off the moisture and my face felt softer than ever! This powerful serum is said to restore skin elasticity and firmness from the deepest layer. Just apply a few drops (in the morning and evening after cleansed, toned face) and tap into skin until fully absorbed. It does not feel sticky and the smell is pleasant. 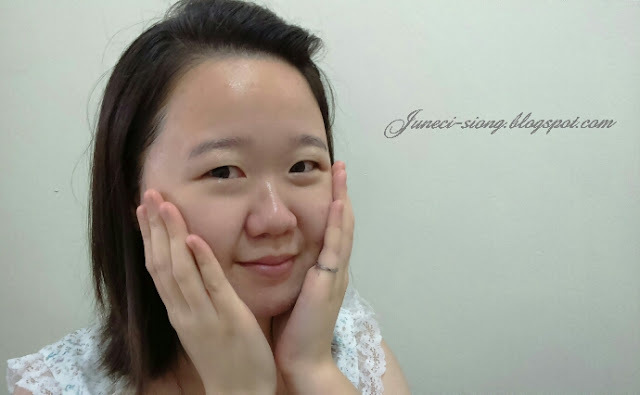 I have only used the Lift & Beauty Serum for 2 weeks, hence no significant results is observed. However, looking at how potent this miracle serum is, I am positive that I will definitely see some good results at the end. Of all products, I looked forward to this lotion most because I have pore issues. Skin Shield's Hydrating, Energizing & Pore Refining Lotion full size comes in Mist Spray, but the one I received is in the form of bottle. I supposed it still works the same; the difference is you can spray this lotion as a refreshing spray on top of makeup while a bottle can't. This Pore refining Lotion is suitable for normal to combination skin. With the Witch Hazel Extract, it helps to reduce the appearances of pores and restores the skin's optimum pH level. This 12-in-1 Ashitaba-enriched base cream has the best of both worlds; Skincare and makeup. Unlike the normal Day Creams, this one is colour tinted and is able to conceals blemish surprising well. It is also protective against harmful UV rays, soothes skin irritation and nourishes skin for youthful radiance. This Day Cream stimulates skin rejuvenation, provides hydration, even out skin tone, anti-aging and fights free radical that is harmful to our skin. Like all Night Cream, this beauty savior works away while we sleep. Apply this every evening on the chin , cheeks, forehead and neck after cleansing and toning. Spread upwards from the chin to the forehead until fully absorbed. Personally, I felt that SkinSoul is relatively a good brand; it's pretty hard to find a Skin care product that can declare 100% free of Paraben and artificial chemical additives. Price wise is on the higher range but looking at all the benefits and one set will certainly last for a long time, Skin Shield is something worth investing. Here's some good news for my readers. Quote '#SSJuneci' the next time you walk into their outlet and redeem a skincare trial set worth RM100 with a minimal purchase of RM100 in a single receipt. All you have to do is show them that you have followed this blog and like their Facebook.